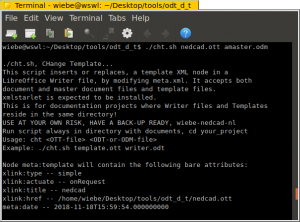 LibreOffice Writer Template Changing - NEDCAD Innovatieve CAD-oplossingen! SVG format is perfectly supported. Vector-based images can therefore be inserted very well. When you work with large documents, there are two annoying peculiarities you should be aware of. The first is that the program stops organizing pages when the document becomes large. This can be overcome in an ugly way. Just add more trees, by always embedding images as a character. It concerns this bug. If you deal with this the right way, then Writer has no problem with documents containing hundreds of pages. The other one is that it is not possible to link templates to documents. This sounds a bit crazy and yes, it may be considered to be a bug. An extension “Template Changer” was available for linking template files. However, it does not work with new versions. That is why we created a BASH script as a tool to solve this. It has been tested on Linux but should also work with Cygwin on Windows. OS-X should work with minor changes, like the date function in Unix does not require an @ sign. The underlying idea is that you have documentation projects where both the documents and the templates are in the same directory. If that is the case with you, then this script can help you. The script is a txt file, put it in your documentation directory, rename it to cht.sh and give it execute rights. Download link: cht , we hope you like it! Update 2018-11-19: Now both ODT and ODM files are supported.